A 360 feedback survey is only the beginning of any development process. What you do with the results of the survey is where you will make change happen and bring about improvements in individual and company performance. 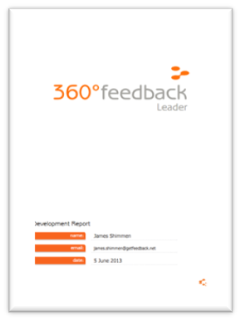 In order to create the most effective development plans it is vital that the results of the 360 degree feedback survey are presented clearly, concisely, and in a way that it is easy for an individual to understand where their strengths lie and where they should focus their development to get maximum results. Getfeedback’s reports are designed to do just this. 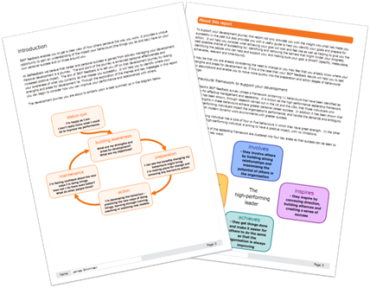 More than simply spitting out a heap of graphs and numbers on an individual, our reports introduce the 360 process, explain the purpose and guide individuals to think about their results and how they should use the information to begin their development journey. Our reports are also designed to be used as a development workbook which can be referred to throughout the year rather than just being read once and then put in the drawer never to see the light of day again. This provides the individual with an introduction to 360 feedback, helping them to understand the purpose of the survey and how it can be used as part of a development process. The introduction also introduces the framework on which the survey has been developed – in the case of our off the shelf surveys the Schroder Framework of High Performance. 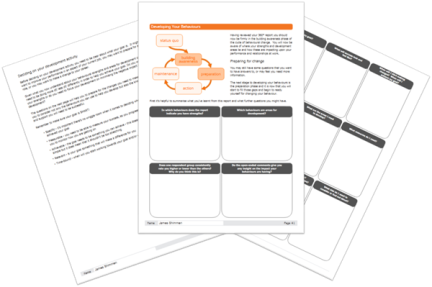 This begins to build awareness of the competency framework and help the individuals understand the behaviours and what high performance looks like. For bespoke surveys our introduction text can be tailored to match your requirements and competency framework. The next section directs the individual in how they should approach the report and the data within it. It also provides a breakdown of respondents per rater group so that the individual can see who has provided feedback*. An explanation of the rating scale is also included before a more detailed set of guidelines for how to read the report and use the data. 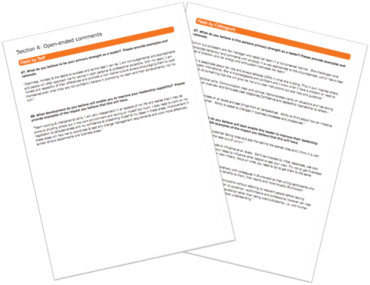 As with the introduction these guidelines can be tailored in our bespoke reports to make them appropriate to your organisation. *Please note that confidentiality of responses is an important part of our 360 feedback process. Only manger responses will be reported individually on the report. All other responses will responses will be reported together, and if there are two or less respondents in a group they will be combined with another group to preserve anonymity. This section of the report provides the individual with a first look at their data. The overview section provides top level data comparing the individual’s self score to the overall average score provided by their nominees for each behaviour/competency. This data is also plotted on a Johari window to show very easily where an individual’s strengths, hidden strengths, known developments areas and any potential blind spots have been revealed by the data. The 10 highest and lowest scoring questions from the survey are also included. The individual is also prompted to think about the data at this point and what it means to them – were these as expected or were there some surprises? This sections breaks down each competency giving an overall score for the competency by rater group along with the breakdown of responses for each question. This allows the individual to dig into the results and gain a deeper understanding of how they are using the behaviour and explore any differences they may be seeing between rater groups. Our surveys include free text questions as standard allowing people to add their thoughts about the individual and what they do well, and how they could perhaps change their behaviour to be more successful. This section provides those comments grouped by respondent category as they were written. This gives the individual greater insight into the impact of their behaviours. Once the individual has reviewed their data the final section of the report asks the individual to think about what this means to them and decide on an action plan for how they are going to use what they have learnt to create a development plan. 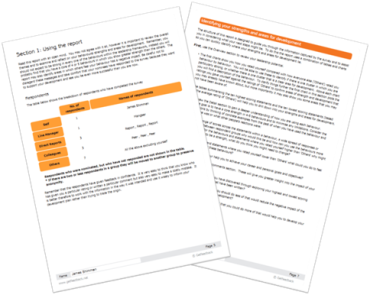 The report provides guidance on how to set SMART objectives and a worksheet to help them put in place a plan as to how they will achieve them. 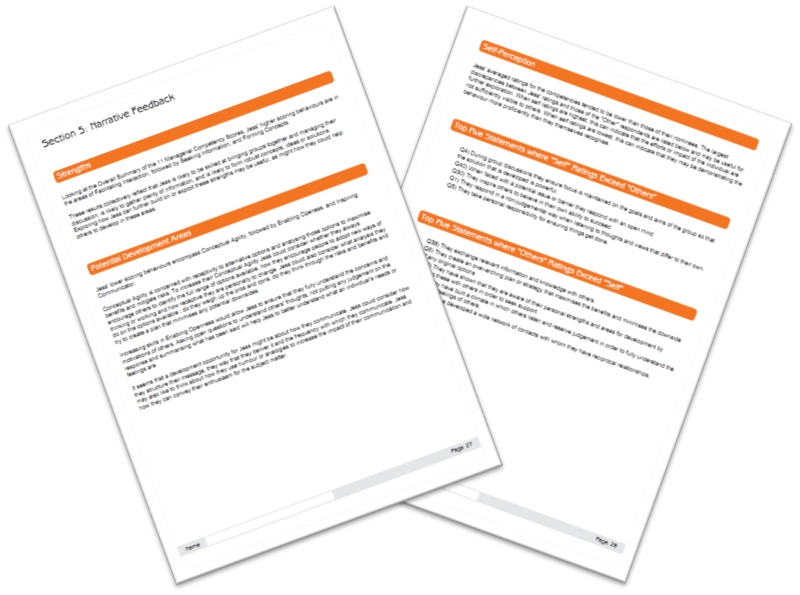 This section can be tailored in our bespoke reports to align with the development processes of the organisation. 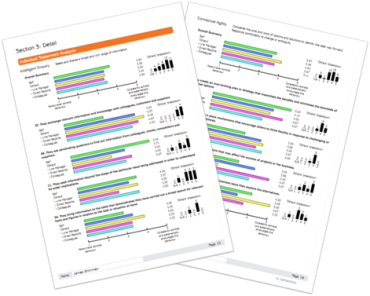 Getfeedback can now offer a new narrative report for our off the shelf 360 degree feedback surveys. 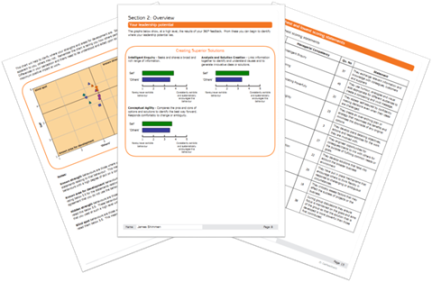 Our standard reports can now include a new optional narrative section that provides the 360 participant with a descriptive overview of their results including strengths and suggested areas for development. There is also an explanation of the individual perceives themselves in relation to others and the related top five statements. This is useful in increasing their self-awareness of their performance at work.